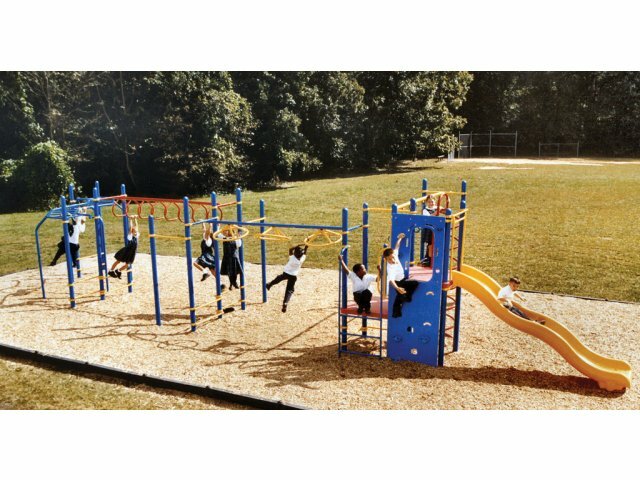 Get your students in shape while they play at recess with this wonderful playground from Kidstuff Playsystems. This fitness playground set includes ten sports events for climbing, sliding and upper body development. With slides, monkey bars and lots of things to climb and hang on your whole class can enjoy the fun together. A vibrant playground set is just what children need. It encourages them to enjoy the great outdoors, challenge themselves in new and exciting ways and see just how much fun exercising can be. This playground is designed for many years of enjoyment, with a rust-proof rotation-molded platform and fade resistant components. Fun Fitness: Features ten sports events including a slide, monkey bars and more.